A family of Spanish origin; represented by members who, after the exile from Spain, settled in Italy and the Orient, where they distinguished themselves as rabbis and scholars. Talmudist and cabalist of the second half of the sixteenth century. He was the author of: "Yad Ḥaruẓim," on the Jewish and Mohammedan calendars (Venice, 1594-95); "Yesha' Elohim," interpretations of Esther compiled from earlier commentators (ib. 1595); and "Marpe la-Nefesh," a cabalistic dissertation on ethics, especially on penitence, according to the system of Isaac Luria (ib. 1595). Fuenn, Keneset, Yisrael, p. 58. Italian rabbi and physician; born at Rome 1630; died at Ferrara 1693. Acquiring early a high reputation both as physician and Talmudist, he was called to the rabbinate of Ferrara and held this position until his death. He was the author of the "Oẓar ha-Ḥayyim," a medical work in thirteen parts, the last of which remained unpublished for lack of funds (Venice, 1683), and of the "Margaliyyot Ṭobot," an abridgment of the "Ḥobot ha-Lebabot" of Baḥya b. Joseph ibn Paḳuda, divided into thirty chapters corresponding to the number of days of the month, each chapter being followed by prayers for various occasions (ib. 1665). In his preface Jacob enumerates the following works which he left in manuscript: "Morashah Ḳehillat Ya'aḳob," on Maimonides; "Yeshu'ot Ya'aḳob," a commentary on Isaiah; "Titten Emet le-ya'aḳob," homilies on the Pentateuch; "Ḳol Ya'aḳob," an index to the Yalḳuṭ, called also "Or ha-Darshanim" ("Oẓrot Ḥayyim," No. 30); "Ẓahalah u-Rinnah," on the Song of Solomon; "Ḳohelet Ya'aḳob," on Ecclesiastes; "Derushim 'al-Daniel," on Daniel; "Milḥemet Ya'aḳob," subject unknown; "Oẓar ha-Shamayim," on theology and philosophy; and "Shubu Elai," on the Shema'' and the benedictions which accompany it. Jacob was much consulted on halakic questions by his contemporaries. His decisions and responsa are found in the "Teshubot ha-Remez" of Moses Zacuto (§ 36), in the "Paḥad Yiẓḥaṭ" (s.v. ) of Isaac Lampronti, and in the "'Afar Ya'aḳob." of Nathanael Segre; the last-named declares that Jacob was one of the three most learned men of his generation. Fürst, Bibl. Jud. iii. 541. Physician and rabbi of Ferrara; died there Nov. 30, 1748. He wrote the following works: "Megillat Naharot," describing the miraculous rescue of the Jewish community of Ferrara from the inundation that occurred in 1707 (Venice, 1707); "She'elot we-Teshubot Meẓiẓ u-Meliẓ," a lecture delivered at the Talmud Torah of Ferrara on the modulation of the priestly blessing (ib. 1715); and halakic decisions quoted by Lampronti in the "Paḥad Yiẓḥaḳ," by Samson Morpurgo in his "Shemesh Ẓedaḳah" ("Yoreh De'ah," § 61), and by Raphael Meldola in his "Mayim Rabbim" ("Yoreh De'ah,"§ 7). Mordecai was a talented Hebrew poet, and several of his religious verses on local events are still recited in the synagogue of Ferrara, while one of his sonnets is also found at the head of the poem "'Eden 'Aruk." Steinschneider, Cat. Bodl. col. 1675. Talmudic scholar of Constantinople in the second half of the seventeenth century; grandson of Yom-Ṭob ben Moses. He was the author of "She'elot u-Teshubot," containing 296 responsa and novellæ on the fifth and sixth chapters of the treatise Baba Meẓi'a (Venice, 1694). This collection includes many decisions made by his grandfather, to whom the author ascribes also a commentary on the Abot de-Rabbi Natan which is probably identical with that given by Azulai under the title "Magen Abot." Fuenn, Keneset Yisrael, p. 444. Palestinian Talmudist; rabbi at Safed; born in 1557; died about 1638. At the early age of twenty-five he was requested by Samuel Yafeh, a rabbi of Constantinople, to decide a difficult and complicated problem which had been referred to himself (Ẓahalon, Responsa, No. 40); and he corresponded with most of the authorities of his time, one of his chief antagonists being the elder Moses Galante. Although a Sephardi, Ẓahalon rendered a decision in favor of an Ashkenazic congregation in a controversy which arose between the Sephardim and Ashkenazim at Jerusalem, and in his love of truth he did not spare even his teacher, Joseph Caro (ib. No. 238), declaring that the Shulḥan 'Aruk was written for children and laymen (ib. No. 76). 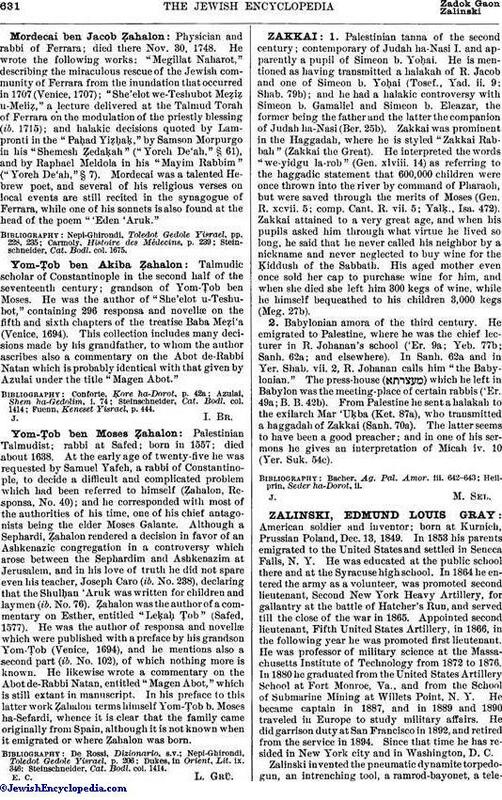 Ẓahalon was the author of a commentary on Esther, entitled "Leḳaḥ Ṭob" (Safed, 1577). He was the author of responsa and novellæ which were published with a preface by his grandson Yom-Ṭob (Venice, 1694), and he mentions also a second part (ib. No. 102), of which nothing more is known. He likewise wrote a commentary on the Abot de-Rabbi Natan, entitled "Magen Abot," which is still extant in manuscript. 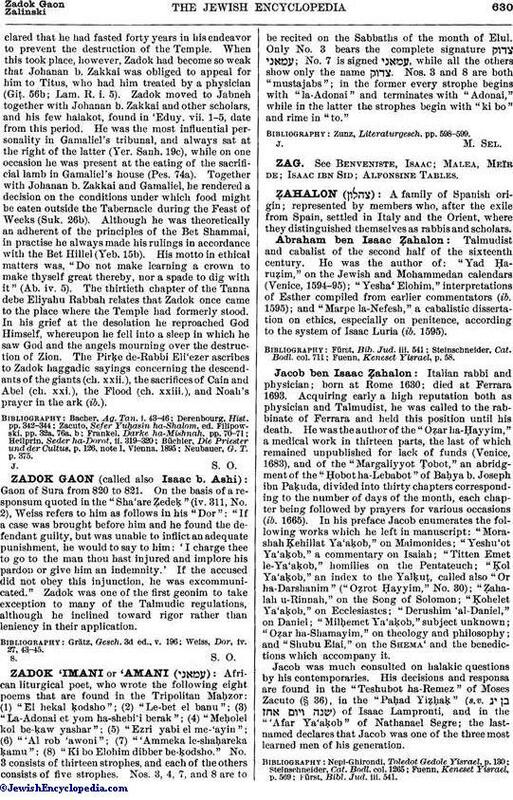 In his preface to this latter work Ẓahalon terms himself Yom-Ṭob b. Moses ha-Sefardi, whence it is clear that the family came originally from Spain, although it is not known when it emigrated or where Zahalon was born. Steinschneider, Cat. Bodl. col. 1414.